I recently bought the Philips Airfryer. I have been weighing this decision for the past several months since it was launched. It is a tempting product to buy because let’s face it we love our fried food. We all drool over those pakodas, fries, nuggets, kachoris and samosas. But the excessive calories due to deep frying makes us stay away. I have two growing sons, and they would love to have their fries and burgers more often. Hence, the lure of airfried food. Hopefully, the taste will be as good sans the ill effects of deep frying. I have been trying many dishes, and samosa is one of them. 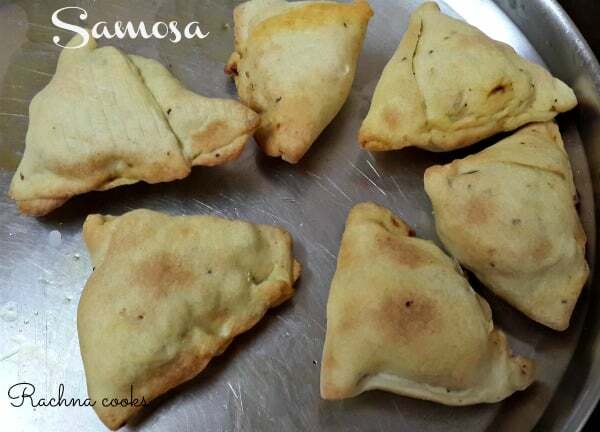 Of course, cooking samosa recipe remains the same if you want to go for the conventional deep-frying method. All you’ll do in the end is deep fry the samosas to a crisp golden brown in hot oil instead of airfrying. This is a delightful snack and popular street food made healthier by making it in air fryer. Try this version to have this tasty snack guilt free. Put the salt and ajwain seeds in the flour. Add in the oil or ghee and incorporate in the flour. It should become the consistency of bread crumbs. Now add water little by little to make a stiff dough for the shell. Keep covered for half an hour. Set aside. Take a tbsp. of oil in a kadhai. Add in cumin seeds and allow them to sputter. Now add in green chilly and ginger paste and cook for a couple of minutes. Add the chopped potatoes and peas to this mix and fry some more. Dry roast all the dry masalas and coursely grind them in mortar and pestle. 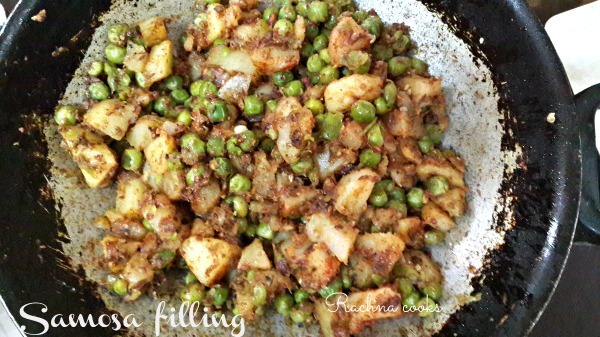 Add in this dry masala mix to the potato-peas mixture. Add salt. Taste and adjust seasoning. Make balls from the maida dough. Now roll out a circle. Cut it into half. Use each half to form a cone by using water as a glue to form a pocket. Put one teaspoon of the cooled filling inside and seal the ends with water. Make all samosas in this manner. Brush lightly with oil and put in a preheated airfryer for about 8-10 minutes at 200 degrees C.
Your samosas will be ready and golden brown. 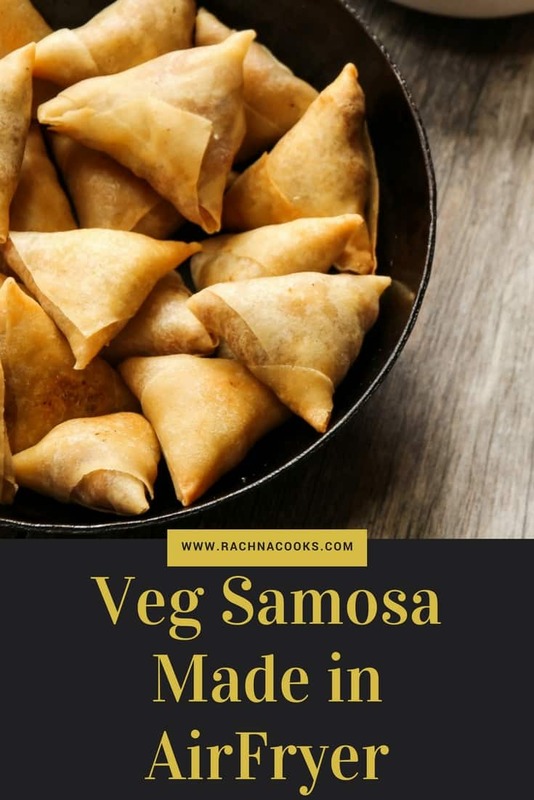 If you wish to have it deep fried, you can just prepare the samosa as per the recipe and deep fry them on medium heat in vegetable oil. You can also bake the samosas in an oven if you don't have an airfryer. Unlike the flaky pastry of a conventional samosa, this one is way crunchier. But, the taste is great. I will try some other tricks to see if the pastry can be made more flaky in some manner with my next outings. The shell is made by rolling out a ball of dough and then cutting it into half. Each half is rolled into a cone and filling is put in to form a samosa. Overall, this is a tasty, much-healthier version of this much-loved Indian snack. Try it. Like I said earlier, you can use the same recipe and deep fry the samosas in hot oil for the good old taste. Your delicious samosa is ready to be had with adrak chai. If you were wondering how to make samosas, this recipe will by your answer. This could be your Ramzan special or Diwali special recipe. Your guests would love it. You can buy Philips Airfryer on Amazon by clicking here. 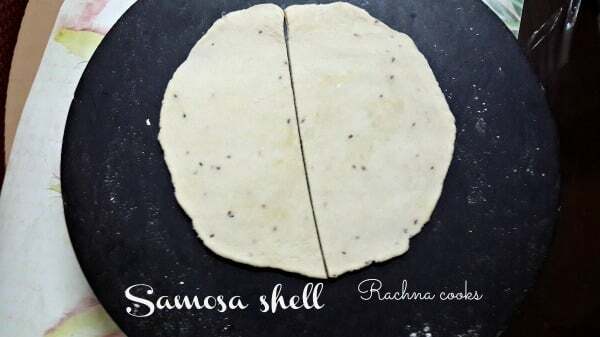 Great post Rachna!It has been ages since I had my last Samosa! I want to buy an Airfryer but I am confused between Philips Airfryer and Usha Halogen Oven with airfryer attachment.Heard this oven is good. Any idea? Thanks, Sharmila. I dislike the market samosa too. So much fat and loaded with unhealthy stuff like Dalda. Makes me sick. I have cursorily read about Usha Halogen Oven. It does not have airfryer attachment. It uses the same airfrying technique. Since it is glass, it looks nicer. It does the same baking, grilling, airfrying that an airfryer does. It has some extra features like cleaning and sterilizing which don’t seem spectacular to me. My experience this far with Philips Airfryer has been really good. I should be putting up a review in a few days. Usha seems nice too. I guess, you will have to wait for someone who has actually used the product to review it. 🙂 Both these products are much faster than our conventional ovens. Oh, the airfryer sounds too good to be true :/ Does it really banish all the calories that accumulate due to deep frying? Does it cook properly? I will be doing a review of my airfryer soon and will be covering all the aspects of taste, calories etc. in that. To answer your questions: It does reduce calories because you are only brushing the fat instead of deep frying. Most dishes I’ve tried so far taste great. There are exceptions that I’ll mention in the post. This samosa is wonderfully tasty but the texture of the outer covering is very different from a conventional samosa. Considering that those are achieved by excessive Dalda, I think this is an option worth exploring. What a coincidence ha ha ha ha guess what .. I just came back home and I bought some samosa and channa..
No other way than to buy from the shop..but we have a great shop and they make yum samosa. .. Try adding some extra ‘moyen’ in the maida next time. I think the pastry will come out flakier. Me too. But the traditional samosa is really so heavy to be had more often. Thanks for the recipe. Will try the baked version of this as I don’t have an airfryer. Have heard a lot about this Philips one. Will look forward to your review. Or have u done one already? Just curious. Have u tried baked samosas? If yes, do they taste similar to the airfryer method? No, I haven’t tried the baked version but I have a feeling that they must be tasting similar. I will be doing the review soon. Haven’t done it yet. Good to see you after a while. Shantala. How was your India trip? I love Samosas and these are such a healthy version of the ones that I usually eat!! I am now very motivated. Thanks Rachna. Thanks, Inderpreet. Glad you liked the recipe. Just increase the oil in your dough to make the pastry flakier. Hope you enjoy them. I think we have a similar product here. 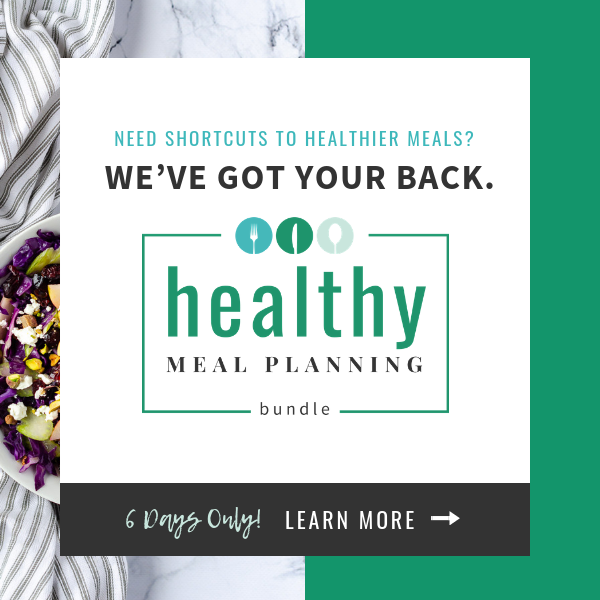 Your samosas like healthier. Do share your tips to make pasty more flaky. Good to know that the air fryer was effective. I don’t eat deep fried stuff but using an air fryer seems possible. Thank you for sharing! I clearly remember the advertisements made by this chef on YouTube through his cooking shows.. Heard of Vaah Chef? He’s the one. I’ve been bugging my mum to buy this super awesome device since then. To no avail. Coz dad is the one holding the purse-strings! Maybe after they read this blog post I might get to devour some Crispy samosas and still manage to stay on my diet? Maybe! Yes, I love that colorful chef. He is quite funny too. 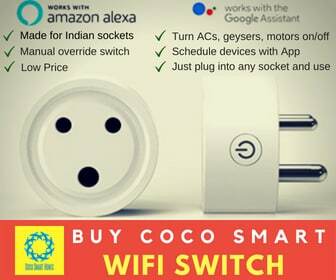 hahaha For your sake, Mithila, I hope mummy and daddy buy the device. It is quite good actually. I was curious to find out if this works ever since I saw the ad on TV! Glad to know it does. I used to try the microwave-baked versions of deep fried foods. But they are, to be honest, not nearly as tasty as their deep fried, unhealthy counterparts! Yes, Sreesha. I waited for a few months because I had my doubts too. But now that I have been trying it for weeks, it is coming up trumps. I am doing a review of the airfryer where I will explore the pros and cons in further detail. That is an interesting ode to our favorite snack, Sabyasachi. During my last trip to Rajasthan, we ended up having a lot of kachoris and puris for breakfast. They fill you up nicely and keep hunger pangs at bay. But, at home, I prefer to have them very rarely. Great recipe. And very simple to follow instructions. Love the fact that preparation and cooking time is less when frying with an air fryer. Thanks for the airfryer infromation. May I know which airfryer you purchased? what was the capacty and cost?. I would like to bake,grill and airfry different stuff. Which is best suitable, a convection microwave oven, air fryer or an OTG? Wao, crispy samosa is really perfect along with tea,i love the recipe. Cook this at 80 temp for 40mins.. Then it doesn’t dries out the pasty… Won’t be flaky but won’t be too hard to bite as well. was wondering if you knew how long to airfry somosas from the freezer? Haven’t tried that so far. Perhaps the instructions on the pack help or you could try by instinct the first time and see.